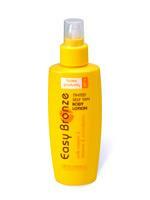 EASY BRONZE SELF TAN products give a natural-looking tan that develops over a few hours then lasts for several days, fading gradually over time. 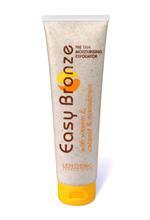 Pre Tan Moisturising Exfoliator has been developed as the ideal one-step product to prepare skin. 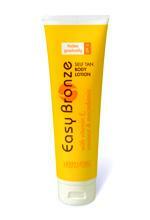 Self Tan Body Lotion [SPF 6] is colourless, but after 2-4 hours gives a golden, natural-looking tan that can be topped up as required. Tinted Self Tan Body Lotion [SPF 6] is a clever 2-in-1 formulation that gives an instant sun-kissed appearance on application then creates a deeper colour within 2-4 hours.